With Kaitei, it feels almost like painting snowflakes onto the wall, and the textures just provide warmth to our heart. There are 12 juraku colors - earthy and greenish tones in this series. Kaitei literally translates as Quick Comfy. Not only does it dry fast, it also provides very soothing ambiance to the room. 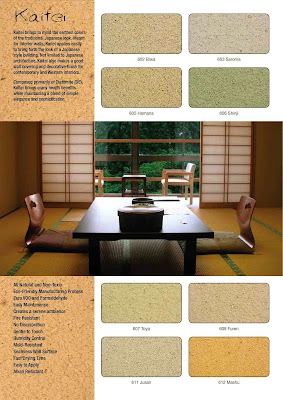 Not only is it suitable for Japanese style architecture, it works perfect for contemporary interiors. This is one of the most lightweight series made of diatomite earth and also inexpensive. You will be surprised that a 1kg material can cover an area of 36sq.ft. One of the main ingredients is lightweight flakes. Once the wall dries up, you will be surprised how a flat finishing can turn snowflake-like puffy texture when it is dry. A quick note that it is also a healthy wall series. Try it and you will fall in love with it.